The joint Hand-in-Hand 2018 China-India counter-terrorism exercise concluded in a great success on December 22. The exercise - primarily focused on joint counter-terrorism abilities - started on December 10, following the arrival of company-sized contingents of the Indian Army and the Chinese People's Liberation Army (PLA). 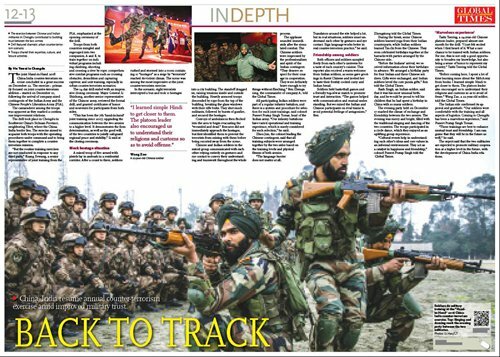 The camaraderie among the troops was apparent as they marked a continuous improvement relations. The drill took place in Chengdu in Southwest China's Sichuan Province, neighboring Tibet, where the China-India border lies. The exercise aimed to acquaint both troops with the operating procedures under command and to bring them together to complete a counter-terrorism mission. "But the routine training exercises are not conducted in response to any third party," Kuang Dewang, a senior representative of joint training from the PLA, emphasized at the opening ceremony of the drill. Troops from both countries mingled and regrouped into two companies, A and B, to train together on individual programs including climbing, shooting and crossing a river by rope; comprehensive combat programs such as crossing obstacles, demolition and capturing captives; and unit training, especially in urban counter-terrorism scenarios. The 14-day drill ended with an impressive closing ceremony. Major General Li Shizhong, another senior representative of the Chinese army, reviewed the formal drill, and granted certificates of honor and souvenirs for participants from both sides. "This has been the 7th 'hand-in-hand' joint training since 2007, upgrading the communication between the two armies to a higher level. It demonstrates the firm determination, as well as the good will, of the two countries to jointly safeguard regional peace and stability," Li said at the closing ceremony. A mixed troop of five armed with pistols lay in ambush in a residential corridor. After a count to three, soldiers rushed and stormed into a room containing 11 "hostages" as a siege by "terrorists" reached its violent climax. The scene was among the most impressive at the joint counter-terrorism exercise. In the scenario, eight terrorists intercepted a bus and took 11 hostages into a city building. The standoff dragged on, raising tensions inside and outside the building. Heavily armored troops descended by rope from the top of the building, breaking the glass windows with their rifle butts. They shot mock militants, followed by bursts of gunfire, and secured the hostages. Convoys of ambulances then flocked into the area to begin evacuating the "wounded and dead." Rescuers did not immediately approach the hostages, but first identified them to prevent the terrorists from mixing with them before being escorted away from the scene. 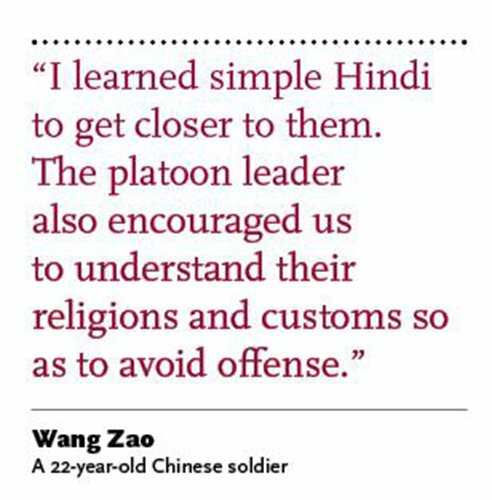 Chinese and Indian soldiers in the mixed group communicated with each other relying entirely on gestures and eye contact to convey their understanding and teamwork throughout the whole process. The applause sounded immediately after the simulated combat. 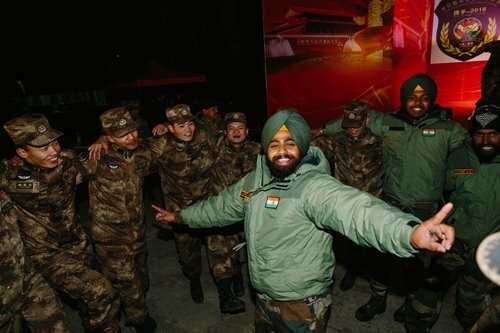 The Chinese soldiers were impressed by the professionalism and spirit of the Indian contingent. "They deserve respect for their courage in cooperation. They were definitely brave enough to try things without flinching," Ren Zhengxiong, the commander of company A, told the Global Times. 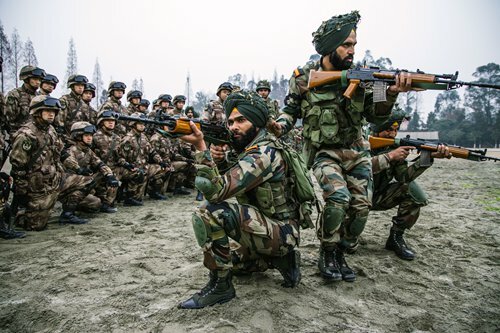 All participating Indian soldiers were part of a regular infantry battalion, and there is a system and procedure for selection for such joint trainings, said colonel Puneet Pratap Singh Tomar, head of the Indian army. "Our infantry battalions have varied operational and training experience, which is surely considered for such selection," he said. Zhou Jun, the colonel leading the Chinese contingent, said that all training subjects were arranged together by the two sides based on the training levels and physical fitness of both armies. "The language barrier does not matter at all. Translators around the site helped a lot, but in real situations, soldiers must understand each other by gestures and eye contact. Sign language works better in real counter-terrorism practice," he said. Both officers and soldiers sampled freely from each other's canteens for a taste of each country's cuisine. This reporter also received a warm welcome from Indian soldiers, as some gave greetings in fluent Chinese and invited her to taste their freshly cooked curry and Indian bread. Soldiers held basketball games and a friendly tug-of-war match to promote trust and interaction. "The games helped with communication and mutual understanding. But we mixed the Indian and Chinese participants on rival teams to avoid potential feelings of antagonism," Ren Zhengxiong told the Global Times. 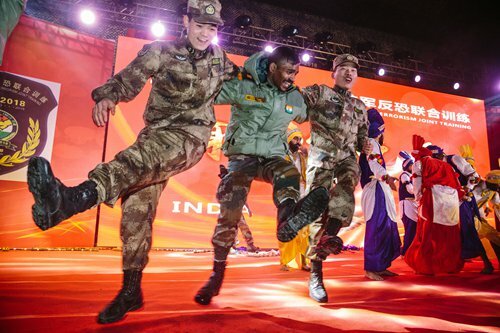 During the break, some Chinese soldiers learned yoga from their Indian counterparts, while Indian soldiers learned Tai-chi from the Chinese. They even celebrated birthdays together at the barracks with parties arranged by the Chinese side. "Before the Indians' arrival, we received information about their birthdays in advance. We arranged a birthday party for four Indian and three Chinese soldiers. Gifts were exchanged, and Indian soldiers loved the cute panda gifts," Ren told the Global Times. Kash Singh, an Indian soldier, said that it was his most unusual birthday, and he would be proud to tell his children that he had spent a birthday in China with so many soldiers. The evening party held on December 17 marked the climax of exchange and friendship between the two armies. The evening was merry and bright, filled with the traditional singing and dancing of the two countries. The troops participated in a circle dance, which they enjoyed as an uplifting group experience. "Cultural events help in understanding each other's ideas and core values in an informal environment. They act as a catalyst in happiness and friendship," colonel Puneet Pratap Singh told the Global Times. Tashi Tsering, a 24-year-old Chinese platoon leader, prepared almost one month for the drill. "I just felt excited when I first heard of it. What a rare chance to be trained with Indian soldiers. For me, this is not only a good opportunity to broaden my knowledge, but also bring a sense of honor to represent my country," Tashi Tsering told the Global Times. "Before coming here, I spent a lot of time learning more about the Sikh Army from books. I learned simple Hindi to get closer to them. The platoon leader also encouraged us to understand their religions and customs so as to avoid offense," Wang Zao, a 22-year-old soldier, told the Global Times. The Indian side confirmed its approval and gratitude. "Our soldiers were comfortable with the training and all aspects of logistics. Coming to Chengdu has been a marvelous experience," said Puneet Pratap Singh Tomar. "These trainings are best to enhance mutual trust and friendship. I am sanguine that they will be in the future as well," he said. The expert said that the two militaries are expected to promote military cooperation at a higher level in the future, with the development of China-India relations.